Renting an apartment should be interesting, different and certainly not a chore. Over the years, our Creative Suites have evolved, and their designs vary Neighborhood to Neighborhood. But regardless of the specific items within, each Creative Suite is designed to help you think creatively and explore the possibilities. Peek into a closet packed with camping gear and flannel. And then there are rock pillows, hanging plants, origami animals, bird watching gear, decorative oars, firewood, grass pillows, a picnic basket for a trip abroad (complete with Spanish scrabble) and assorted camping lanterns. 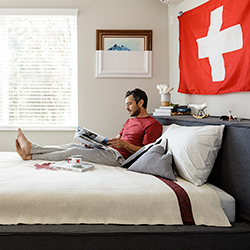 Finally, a bedroom decorated with a teepee tent, or mountain pillows and a Swiss flag to remind us of the alpine dream. We also add in some unexpected touches in places like the washer and dryer. But we’re not going to give away all the surprises. You’ll have to come see them for yourself! We hope you find our Creative Suites intriguing and fun, and that it feels like home: where the journey begins, and where the journey ends.